Rotkappchen-Mumm Sektkellereien, located in Freyburg at the Unstrut in Saxony-Anhalt in Germany, looks back on a long and eventful history of 150 years. The company, founded in 1856, succeeded in integrating itself in the free market economy after the German reunification. In 1993, five managing employees, together with the Harald Eckes-Chantre family, took over the sparkling wine producer from the trust by means of a management buyout. By 2001, Rotkäppchen Sektkellerei was the market leader in sparkling wines. Its highly successful marketing strategy made it possible for the company to continuously expand its market share and to become the leading sparkling wine label in the region. Today, the company produces sparkling wines, still wines and spirits at 5 different locations. In Freyburg alone, around 150,000 bottles are filled every day. 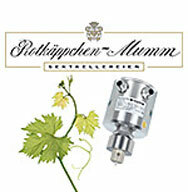 To control the wine stabilization process, Rotkäppchen-Mumm uses ILM-2 conductivity meters from NEGELE. Tartar refers to calcium salt (calcium tartrate) or potassium salt (potassium hydrogen tartrate), both of which can occur through the combination of tartaric acid with calcium or potassium.While this may be tolerable in still wines as an indicator of a high mineral content, the “wine diamonds” are undesirable in sparkling wines.Apart from visible quality impairments, the crystals in this case lead to “gushing”, the uncontrolled, profuse overflowing of foam when a bottle is uncorked.In addition to the concentrations of tartaric acid, potassium and calcium as well as the pH level and the alcohol content, temperature also plays an important role in the crystallization process. The lower the temperature, the lower the solubility – and a lower solubility leads to the precipitation of tartar. 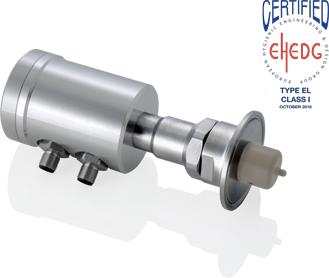 Therefore, one of the ways to stabilize wine is to accelerate crystallization through cooling and the addition of tartar crystals, which act as crystal seeds and promote the precipitation of tartar (so-called contact method). At the winery, tartar crystals are added to sparkling wine that has been cooled to approx. -1 °C (stabilization temperature) in a reaction tank (contact tartar). These contact crystals combine with the dissolved potassium or calcium salts in the reaction tank at temperatures close to freezing.The conductivity of the unfinished sparkling wine is affected by the presence of tartar. 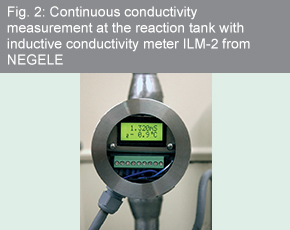 As tartar crystallizes out, the number of free ions in the sparkling wine goes down, reducing its electrical conductivity (measured in millisiemens) until no more crystals are formed.The conductivity in the reaction tanks is continuously monitored with the ITM- 2 inductive conductivity meters from NEGELE via a bypass.Once the crystallization process is completed, the conductivity stops dropping and the sparkling wine is “wine stabilized”. 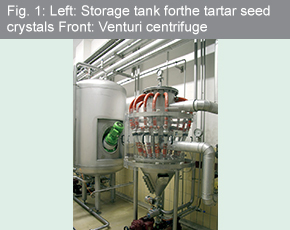 Experience has shown that this process takes 3-4 hours.Subsequently, the (heavy) crystals are separated from the “tartar stabilized” sparkling wine using a Venturi centrifuge (hydrocyclone) before the sparkling wine is fed to a plate separator for further processing.The conductivity of the unfinished sparkling wine is a measure of thetartar content and thus a decisive process parameter in meeting the high quality requirements for the products of Rotkappchen-Mumm Sektkellereien GmbH.We are pleased that RotkäppchenMumm Sektkellereien GmbH trusts in the measuring devices of Negele Messtechnik GmbH to meet their high quality standards.